There's little in life I admire more than weirdness and originality, preferably both in the same work. And so, it's my great pleasure to introduce you to the oddest picture book you're likely to see today, The Awfulbet, written and illustrated by John McRandle. 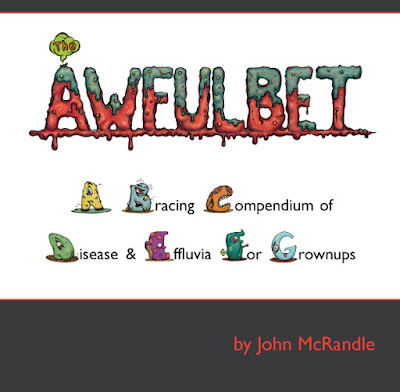 The Awfulbet: A Bracing Compendium of Disease & Effluvia For Grownups is an ABC book with a collection of 26 letters who endure a wide range of amusing afflictions. From Acne to Zombification, and all infirmities in between, each letter has been given an alliterative assortment of awfulness. For example, meet ‘B, who is Beset by Bunions, Baldness and Boils’, or ‘R, who is Ripe with Ringworm, Rosacea and Rabies’—the characters of the book possess a certain comical charm that will appeal to kids and grownups alike. This is my first book, and my first foray into the world of self-publishing. Starting as a germ of an idea two years ago, the project came to me in a late-night burst of creativity. The writing was the fastest part, with the droll diseases flowing from my pen. 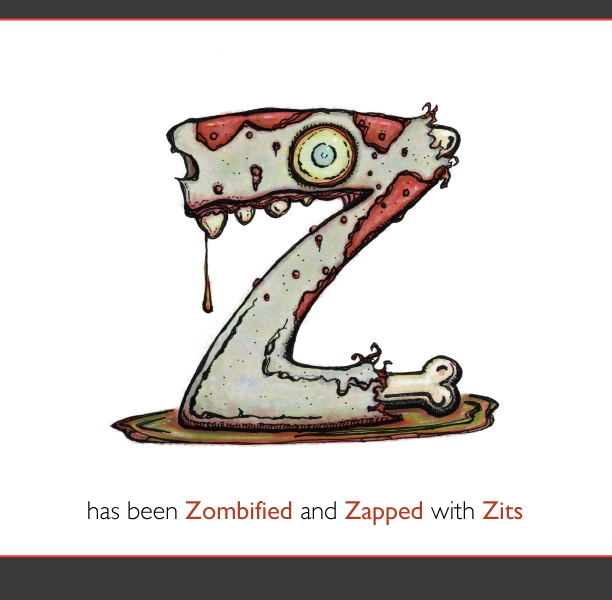 But the illustration took a lot of time, as each letter’s illness had to be anthropomorphized and personalized to build the character. I suppose the genesis for The Awfulbet can be traced back to my youth reading Mad magazine and collecting Topps’ Wacky Packages, which fueled my interest in the sort of subversive humor that kids love. Some of my largest influences are Dr. Seuss, Edward Gorey, and Roald Dahl, as they play a huge role in my literary and artistic interests—and my love for darker and more disturbing work. As a young person I was fascinated by the creatures you would find when turning over rocks, or the strange old things you'd find packed in the attic or basement that had been discarded by their owners but still had stories to tell. Growing up as the child of a German historian and an audiology professor, I always had an interest in language and science. We had a large library filled with art, natural history, and science books, and linguistic humor and wordplay were always popular in our house. What I hope to do with The Awfulbet is make something curiously creepy and grossly entertaining that appeals to the 13-year-old rock flipper and attic explorer in all of us. 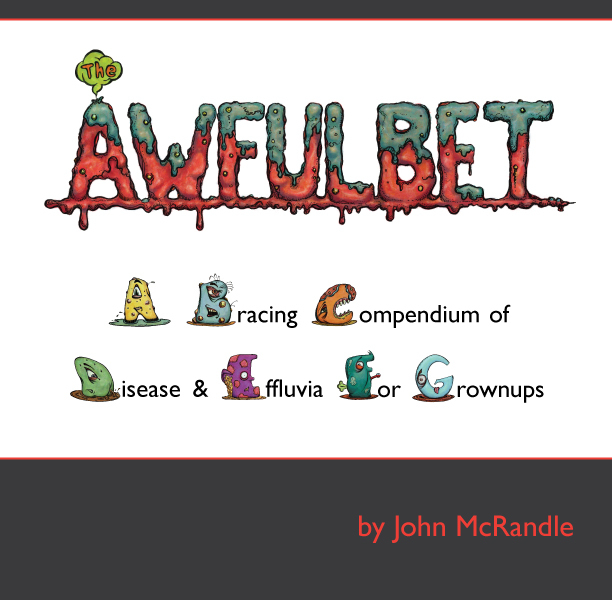 The Awfulbet: A Bracing Compendium of Disease & Effluvia For Grownups chronicles the sad state of affairs in which these endearingly ill letters find themselves. From Acne to Zombification, there is no end to the problems these troubled souls will endure. This contagious interpretation of an alphabet book springs from the fevered mind of John McRandle, a New York-based illustrator and musician. Night after night, he toiled until the wee hours, delving into the lives of these 26 little creatures. Now, the fruits of his labor can be yours! Learn more about The Awfulbet on the book's website. You can purchase The Awfulbet from the Blurb bookstore. There was a swirl of thought placed into the development of my characters for my latest book. Even more so into the location where this great and magical love should grow wings and take flight. During the research side of writing my latest book, So a Psychic and a Rocket Scientist Walk into a Bar, I decided to set the locale as Taos, New Mexico. Taos is an interesting artistic hub bub of modern and indigenous art. Taos went very hippie in the '70s and thankfully, never quite recovered from it. This legacy of art, peace and free love leads us to one of Taos’ most prolific and well-known visual artists. This artist is mentioned briefly in my book. He is Ted Egri. My female protagonist has a piece of his. He represents a blending of indigenous art and regional legacy. Taos has a very prolific culture of art. This art is a mix of indigenous stylings and contemporary takes on historical folklore and canon. The art ranges from pottery from very early indigenous tribes to modern digital media. While my characters did not delve into the visual arts scene, it would be remiss to not point out that visual art is Taos’ most valued cultural contribution. 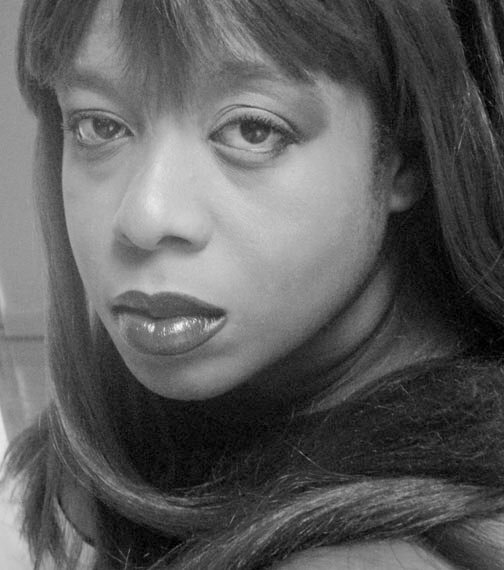 Even though I write, my first artistic love is visual art. Years ago I studied some of the contributions from this area. I was impressed and moved by the cultural history and authenticity of Taos’ artistic scene. So when I wanted to really immerse characters in a place where magic could be believed, I dedicated this location to the cause. I also desired to point out the importance of indigenous voices. Art as it exists and lives is much like writing in the idea that it is a living tangible expression of the most poignant aspects of the human soul. As artists it is important to recognize our roots and how they have influenced where we are as a species. What our artistic futures can hold. In the shards of a dish that is thousands of years old we can see the parts that carried us and made us. There is the need for community, sustenance and care. A bowl is a symbol of how we should preserve and treat our art. We carry the best of it. We carry as much as we can. Not only for ourselves but to share with others. You can learn more about Suenammi Richards on her blog and by following her on Twitter. 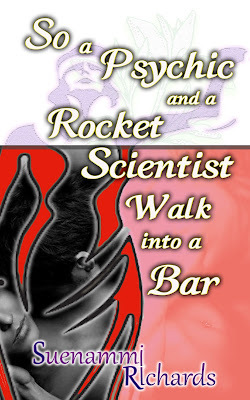 You can purchase So a Psychic and a Rocket Scientist Walk into a Bar on Amazon. 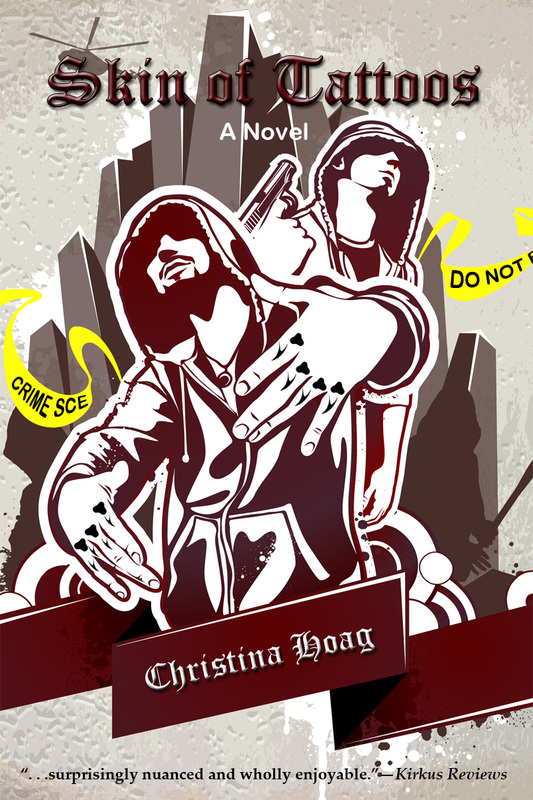 As a fiction-writer with one foot in the world of journalism, I am especially interested in this guest post by Christina Hoag. But hers is a type of hardline reportage much different from my own experience. For Skin of Tattoos, she found inspiration in an element of society that most of us hope to avoid. But we're thrilled to read about it! Welcome, Christina. Skin of Tattoos is set in the gritty underbelly of Los Angeles’ gangland, the darker side of the palm-studded, movie-star lifestyle that L.A. is known for the world over. Why, readers have asked me on more than one occasion, did you write about gangs? In 2000, I was sent on a magazine assignment to El Salvador for story about gang members deported from Los Angeles to their birth country, which they identified with, but really didn’t know because they had left, fleeing the 1980s civil war, when they were infants and small children. Some of them barely spoke Spanish. Growing up in L.A., they had joined gangs to protect themselves against long-entrenched Mexican-American gangs who didn’t welcome outsiders. But because the Salvadorans weren’t U.S. citizens, they later were vulnerable to deportation when the government started cracking down on immigrants with criminal records. The stories of the young men I interviewed, who were basically stuck between worlds, struck me as an unusual outcome of both a civil war and an immigrant experience. I tucked it away in my mind as a great premise for a story, and a couple years later, I wrote an outline for a novel and stuck it in a drawer. In 2008, I became a reporter for the Associated Press in Los Angeles and ended up covering gang issues. I dusted off that old outline and started writing, although I stopped and started many times, not confident that I could pull it off. I got a lot of encouragement in writing classes I took, however, and eventually finished it. I then ended up collaborating on a nonfiction book with a former Black Panther who had formed a programme to turn former gang members into community peacekeepers with the aim of stopping the cycle of retribution that drives gang violence. That book, “Peace in the Hood: Working with Gang Members to End the Violence,” is now being used in several universities as a textbook for courses that involve urban communities and policy. After many rewrites and even more rejections, Skin of Tattoos landed a publisher and was published in 2016—sixteen years after I did those initial interviews in El Salvador. It was a long journey, indeed, but I learned valuable lessons: Write about something you’re passionate about so you don’t lose interest along the way and success is a lot about perseverance. Learn more about Christina Hoag on Facebook and Twitter. It's launch day for RED SPAWN DELIVERY, third installment of the Webrid Chronicles! Time to go planet-hopping with a giant, hairy Yeril again as Webrid gets forced into another misadventure. Get a paperback from the publisher! Ganpril Webrid's grandfather always told him not to use his cart unless he was getting paid for it. But this huge, hairy carter on the planet Bexilla let a friend talk him into carting beers and grub to a picnic with her old college roommate. Worst mistake he ever made. 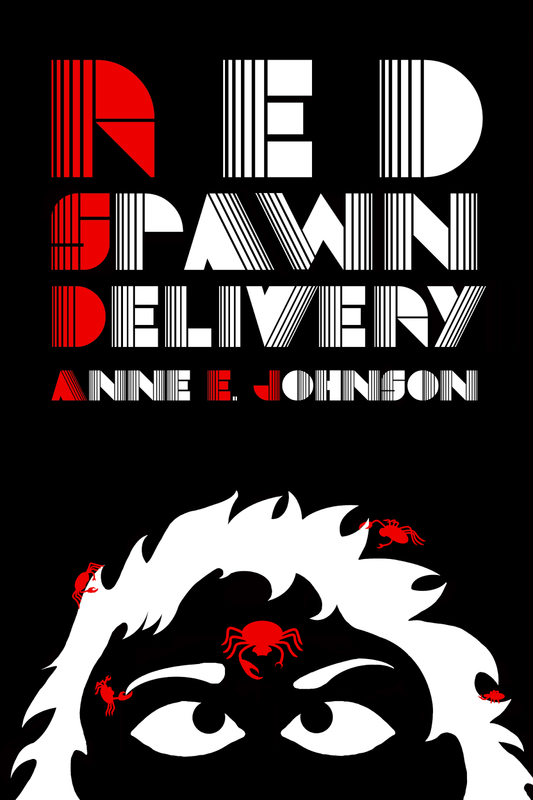 Before he can even burp up his first sandwich, the ol' roomie stretches out her ten shiny legs, and out pop a hundred spawn. And before Webrid can settle his churning stomach, fifty of those spawn have been kidnapped. Like it or not, Webrid finds himself on another planet-hopping adventure with snarky, brainy pals Zatell and Stravin and a host of wacky aliens. This time, Webrid's cart turns into an interplanetary playpen--or it will, if he can only find those blasted spawn.